When it comes to baseball, no one celebrates their love of the game like Latinos. It’s in our blood to be obsessed with baseball, but there are some MLB fans that take it to a whole other level. 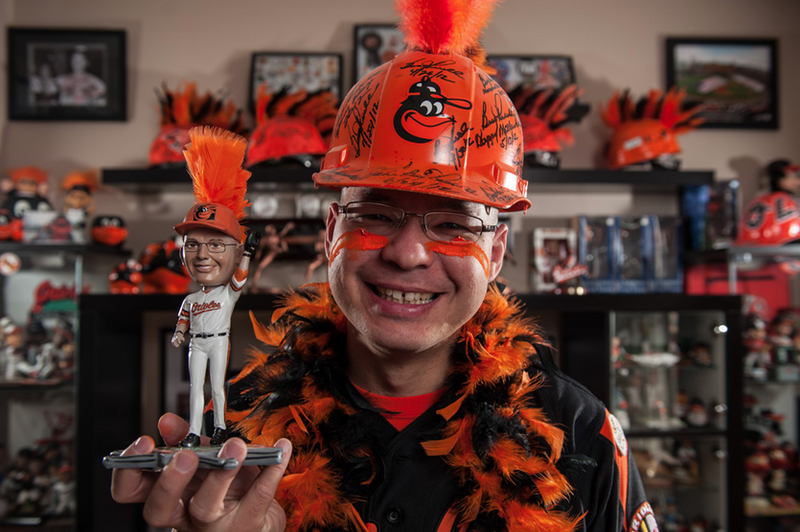 Here are 8 Latino MLB super fans that are totally changing the way we celebrate the game. If you are a New York Mets fan, then you have definitely heard of Eddie Boison or, “The Cowbell Man.” You can catch this die hard Latino fan at every game getting the crowd excited with his signature instrument. With their recent success, there’s no doubt that Mets fans have playoff fever and the only prescription is more cowbell. The Bleacher Creatures are a loud, fiercely loyal, and often raucous group of super fans of the New York Yankees. But it all comes down to one man – Ali Ramirez – who founded the group by hitting a cowbell (seems to be a theme!) in the ‘80s and ‘90s. There is even a plaque on a seat 29 in section 39, row A that is dedicated to him. If there’s one Latino that loves the Baltimore Orioles, it’s Romeo Santos. In 2013, Santos was elected into ESPN’s Fan Hall of Fame. In 2011, When Santos’ wife passed away to breast cancer baseball helped him grieve. He does everything from teach fans how to get their baseball signed to fundraising for charity with Orioles tickets. Every game, he shows why Latinos are the most passionate fans in baseball no matter where we are. Latino fans know about dedication. Have you ever loved something so deeply that you decide to stop working for 6 months just to enjoy every second of it? Julio Rodriguez does, and he loves the Miami Marlins enough to take an extended sabbatical. The Marlins Fan of the Year waits for autographs from the players before and after every single game. He comes early enough for batting practice just to snag a few baseballs and say hello to the players. Julio is living every fan’s dream while becoming a part of Marlins lore and proving again why Latino fans do it best. CAN WE ALL TAKE A MOMENT TO APPRECIATE THAT ‘STACHE? It’s worthy of its own fan section and it belongs to Valentin Jalomo, a super fan of the Houston Astros. Jalomo hasn’t missed a game in 10 years. Recently, he was nominated for the MLB Houston Astros Super fan of the year. He didn’t win, but no worries. Any man with his loyalty and that facial hair is a winner in our hearts. Originally from Honduras, Emma “Crazy Blue” Amaya fell in love with the LA Dodgers at a very young age. She uses Facebook to broadcast her fandom daily! For many years, Vin Scully has been her Dodger game companion via radio. With his retirement comes her dedication to him, a score card is filled out every game in honor of Vin Scully’s love of doing the same. Keep holding it down for all the Latinos in Dodger blue, Emma! Winners of the Diamondbacks 2016 MLB Fan of the Year, Julius Ingram is a ride-or-die Arizona fan. Sticking to his goal of wearing Diamondbacks gear every day, he’s gone 9 years so far and is still going! He’s so dedicated to going to games that there have been times where he’s paid for tickets with pennies! Unapologetic and full of pride, yet another example of Latinos being the most committed fans in baseball! Some fans make the most of their 15 minutes by increasing their follow count. Super fan, Hiccups the Clown uses his fan stardom to increase his volunteer count. Every month, Frank Mercado goes down to skid row to feed and clothe the homeless. His goal is to feed over 300 people every trip and the support for Mercado’s cause hasn’t stopped. Being a season ticket holder, Hiccups has been a staple of the Dodger stands for years. When he’s not at a game or helping the less fortunate, he is entertaining families at parties as Hiccups the Clown. Thank you, Frank, for showing that Latinos can be more than Hall of Fame fans. They can be Hall of Fame people too. All of these fans show the importance of Latino fans in baseball. We may be extra at times but we are dedicated, loyal and passionate. Latino fans are simply the best!